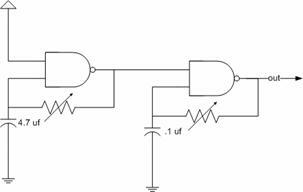 LFOs or Low frequency oscillators are a very basic building block used in many circuits. Without a slow moving modulation, sounds are just…static. They can take just about any kind of wave form, but generally are something like sine, triangle, ramp or square. Many of the circuits here that are LFOs can really be made into work in audio frequencies as well. By far, the easiest circuit to work with is a square wave oscillator built around a schmitt trigger. The CMOS CD40106 is the workhorse of the Lunetta world. It gives you a nice 50% duty cycle and tolerates all kinds of voltages. With a handful of parts, you are on the way to blinky heaven. Here is a simple example from Hackaday.io (above image from there too). Just follow the link for a nice tutorial. The above image appears to be in the audio range, so just make that capacitor like 2uf and it will go much slower. You can go fancy with math or just swap out caps until you find what you are looking for. You can also use the CD4093 Nand. Nandsynths are probably the second most popular squarewave noise circuit to build after the Atari Punk Console. Rather than one input, you have two, so you can use it as a gate of sorts. Here is a good example from FluxMonkey. In this case, the first nand gate is oscillating on and off at a very low frequency ( see the big cap at 4.7uf). Setting the one input to high effectively makes it a NOT gate oscillator. This feeds the second gate that is oscillating 47x faster (assuming same pot). The LFO will turn the second gate on/off so you get an ear-grating beep beep sound. 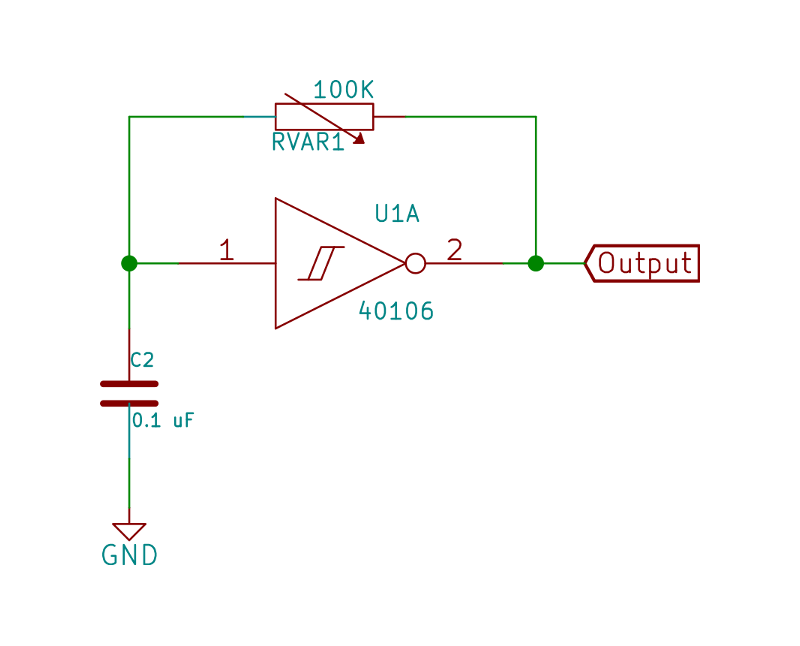 Probably the most used one you will find on the internet is the two op amp configuration. In this case we have the schmitt trigger driving an integrator. That produces the triangle wave form that feeds back to the trigger to start the whole process over again. You certainly can use the 555 to build oscillators as well, however, it takes a few more components to get a 50% duty cycle. i would tend to use this for ASDR circuits. Its a fascinating little guy. The psycho lfo creates a modulation like a sample hold on a random waveform. It is basically a bank of low frequency squarewaves summed up. There is usually a rate knob, and to be honest, you only need one. I have seen circuits where folks feel the need to add more pots. Just a waste of space. A glide kinda helps nicely too. For low frequencies, an ATTiny has more than enough firepower to build any wave form you can think of. You might need to interface it a bit with transistors and voltage supplies. For my first real modular, I place to use a microprocessor. In the meantime, I have experimented with em quite frequently.